This week’s Iron Craft was about flowers. 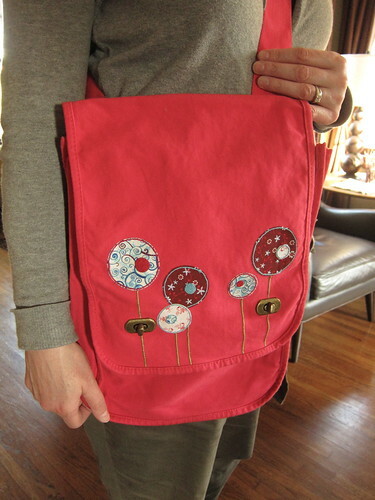 At first I thought I was going to make a fabric flower pin or perhaps some pom-pom flowers but, then I won this messenger bag from Sew Lovely Embroidery. 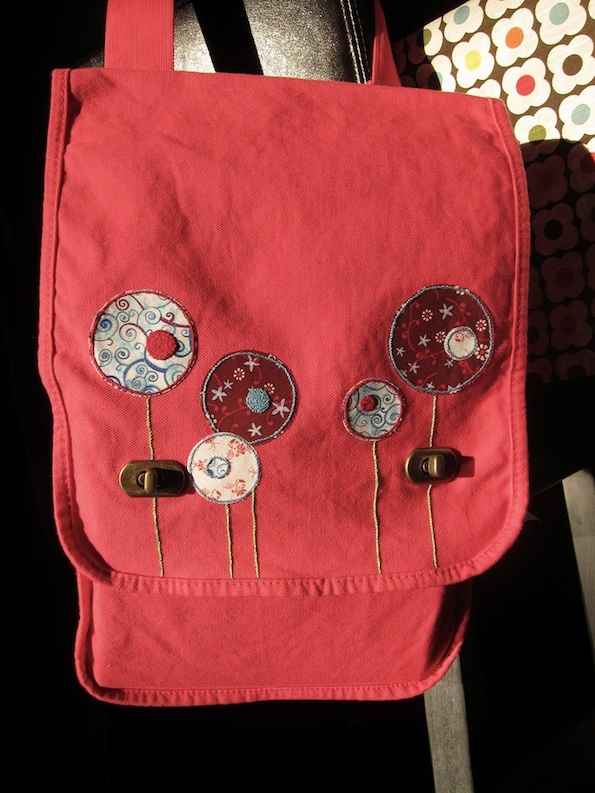 The bag is made to embroider so, I decided to make it my project. I like the way the toggles make the leaves on some of the stems. I’ve seen a lot of this kind of modern flower on quite a few quilts and really love the way they look. I made mine with a combination of applique and embroidery. This technique can be done on all sorts of things, not just a bag. With a lighter fabric you will probably need to use a hoop for the embroidery but, the bad was stiff enough that I didn’t. 1. 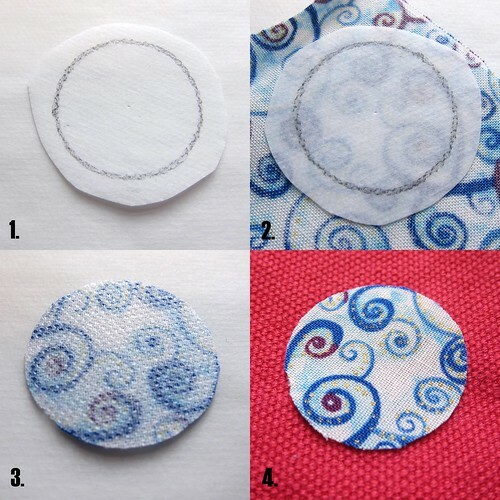 Use the compass to draw various size circles on one side of the fusible web. Cut our roughly around each circle. 2. Take the paper of the side of the web you did not draw on and stick it to the wrong side of the fabric. 3. Cut the circle out of both the web and the fabric. Remove the other paper baking to reveal the webbing. 4. Place the circles where you want them on the bag webbing-side down. Iron to adhere permanently. 1. I outlined each flower in stem stitch close to, but, not exactly on, the edge in a contrasting color. 2. For some of the flowers, I added a smaller circle in a contrasting fabric for the center. Those smaller circles were also outlined in stem stitch. 3. & 4. For other flowers, I made the centers out of circles of french knots. I found the way to get the nicest circle was to draw one on, do french knots all along the outline and then fill it in. 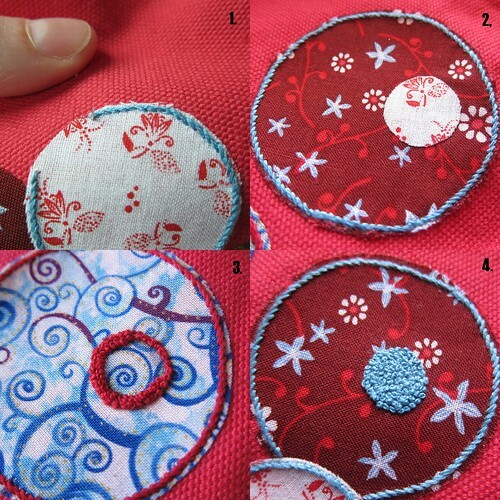 Starting from the middle & working out made it hard to get a circle with a nice edge (see my blue one above). For the stems, I drew straight lines from the middle of each flower using a ruler and a dressmakers maker. Then embroidered them with stem stitch. Since this is a bag that is going to get used I knotted the beginning and end of each thread. When I was completely done I put a little fabric glue on each knot to keep it secure. That's awesome! I want one. The flowers are adorable and I love the colors. So cute. I love this bag. i love those round flowers. great design! You made this bag even better! Love it! 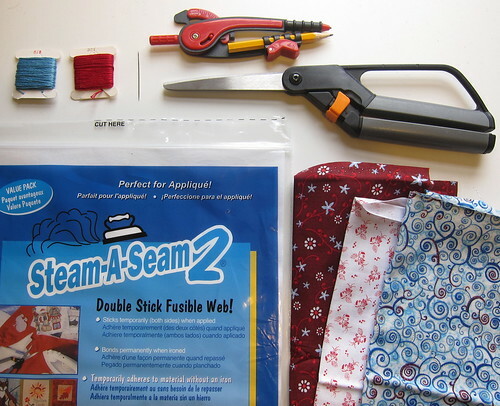 And fabric glue on the ends – great advice.